The Microsoft Azure Cloud Platform is a very powerful enterprise cloud. It does many things, from running websites to Virtual Machines to Machine Learning. As a student, you get $100 of Azure credits annually – no credit card required. 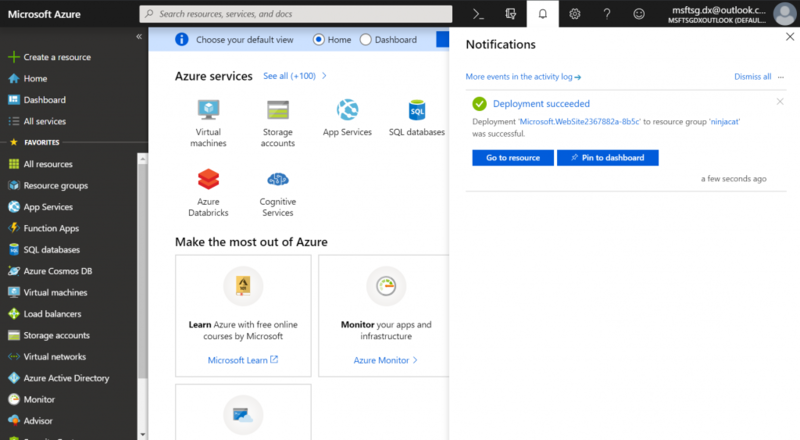 Additionally, get access to over 25 always free services – including hosting up to 10 websites via the Azure App Service or even the Azure Face API to do facial recognition. 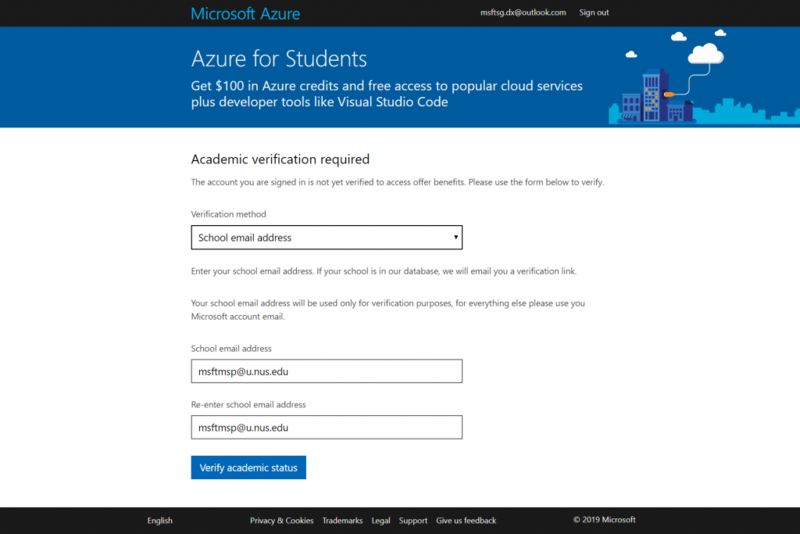 We’ll start small for now, showing you how to claim your Azure for Students account and get a website running. 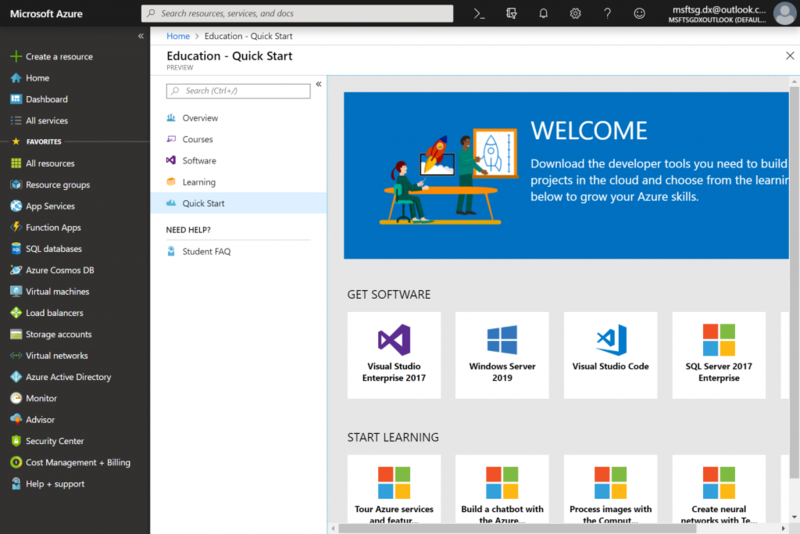 We’ll first navigate to https://aka.ms/Azure4Students and hit [Activate now]. Sign into a Microsoft Account if prompted. This is generally a Hotmail or Outlook account. If you have not done Academic Verification before, you’ll be asked to enter your student email address. In NUS, this should be your eXXXXXXX@u.nus.edu account. In NTU, this would be XXXXXX@e.ntu.edu. A verification code will be sent to verify your email. Agree to the usual T&Cs and hit Sign Up. Sit back and relax while your subscription is generated! 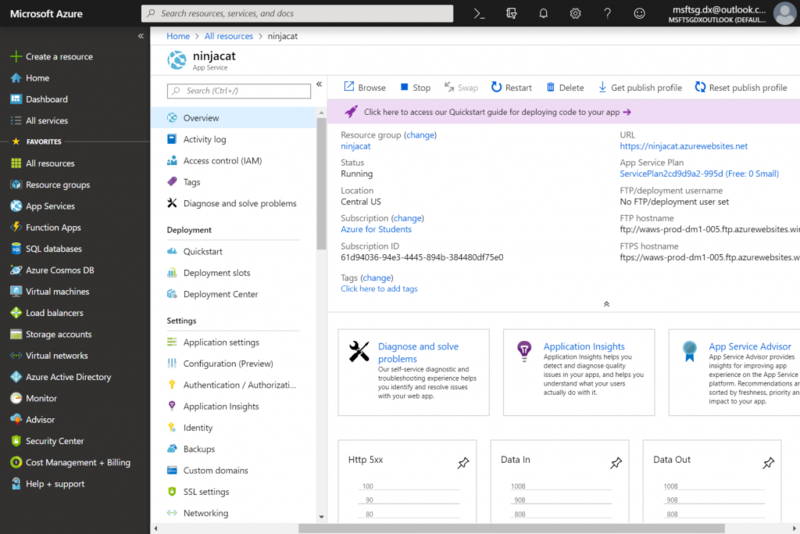 Now that you’re in the Azure Portal, you can explore around to see all the cool stuff you can do. There are also Quick Start guides around that you can check out in your own time. We’ll want to hit [Create a resource] on the left, then [Web App]. Give your Web App a name, then name your new Resource Group (can be the same). The Resource Group lets you pool together resources for a specific solution, but that’s not important now. Optional: You can change the App Service Plan to a non-free tier (free is under Dev/Test -> F1) – remember you have $100 credit to play with! You can also change the Location to South East Asia. Just click on [App service plan/Location] and [Create new]. Hit [Create] and let the App Service get ready. Once your App Service is ready, you can find it under All Resources or App Services on the left. Click on it to open. 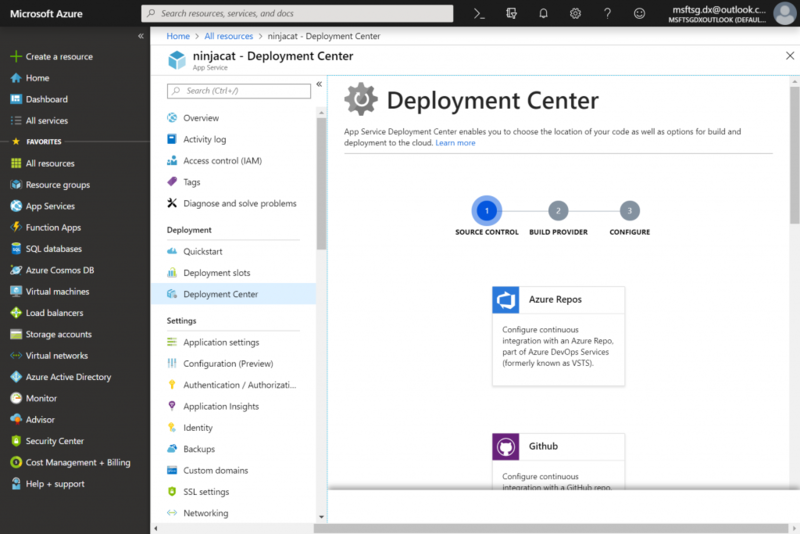 We’ll now deploy our website using the [Deployment Center]. There are many ways to deploy your code, including Github, FTP, OneDrive, and Dropbox. For this demo, we’ll show you how to use OneDrive, Microsoft’s Cloud storage that comes with your Microsoft Account. If you’re more comfortable with Dropbox, you can use that instead. Look for OneDrive/Dropbox under Deployment Center and click on it to Authorize. 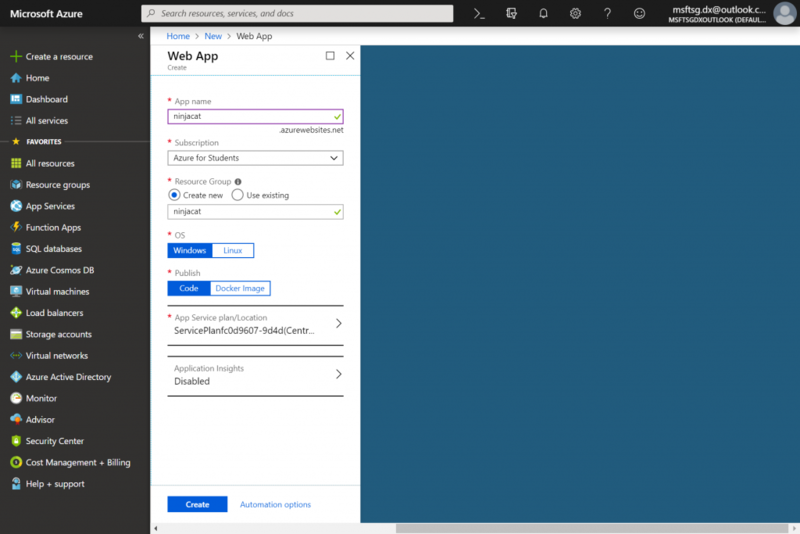 An “Apps” folder should be created in your OneDrive account, with another folde “Azure Web Apps” inside. There, make a folder that contains your code. The folder structure should be OneDrive\Apps\Azure Web Apps\ProjectFolder. If you are using Dropbox, the folder structure is Dropbox\Apps\Azure\ProjectFolder. Select your project folder and press [Finish]. Your deployment is set-up, just hit Sync and your code is deployed! You can now visit your live website at https://<yourprojectname>.azurewebsites.net. Your hard work has paid off! Your spiffy new website is now ready for the world to see. What will you make next – an online resume, portfolio, blog, or project? You can read more about Deployment over at this guide: https://roc.ms/deploy-content-sync. Azure is a very powerful Cloud and if you are interested to learn more about it and other Microsoft technologies, visit Microsoft Learn at https://aka.ms/Learn.